Among the zillions of issues to handle while raining a child, teething period of kids can bring an array of assorted problems like toothache, fall of teeth before time, darkened teeth as a result of fall, long gap between loss of teeth and showing up of new adult teeth etc. Even though you know a lot you need timely expert advice to keep your doubts regarding teething problems in kids. 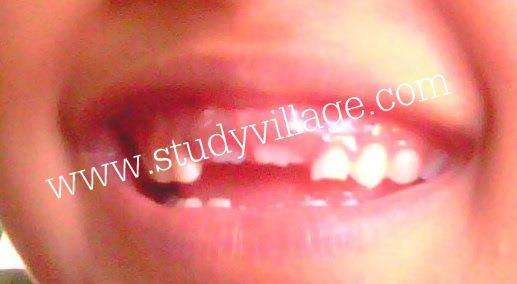 Here are some real tooth loss images, home remedies and solutions for teething period of your kid. The baby teeth(commonly known as milk teeth/deciduous teeth) of your bundle of joy come so easily that you cannot imagine how problematic it can be when the milk teeth give way to new adult teeth. There are some common problems which everyone faces. First, new tooth start developing without extracting the earlier tooth. Secondly having started tooth decaying or dental caries starts at an early age like like 4 or five years. This mostly happens to kids with poor oral hygiene. Thirdly the new tooth not having enough space because of the already existing teeth. Losing baby teeth: How many teeth your kid is going to lose? When I asked my dentist how many teeth my daughter is going to lose, his reply has almost stunned me. He told me that all will go. Means? She will lose all her teeth present in her mouth now. (That would tentatively 25 in all). But when the cycle of tooth losing will be complete you never know. So the actual answer to how many teeth your kid will lose in the process of adult teething will be approximately 25 as a kid. Some medical websites also have confirmed this fact. The process of losing baby teeth if starts at six it ends at the age of 12. It is believed and also studies show that female kids are ahead of male kids when it comes to the tooth loss/exfoliation or eruption of new adult teeth. The tooth fairy normally visits for the first time when kids are arround 6-7 years old. (Kids in different countries believe that when they lose a tooth it should be kept under their pillow and in the morning they will find a gift from tooth Fairy who replaced the tooth for the gift). No doubt, it is to console the kid who find it difficult to deal with the loss of teeth. The middle/front teeth of the upper or lower teeth is the first one to go usually. The ones which come out are called the central incisors and they have to make permanent teeth. This starts happens first time when your kid is at 6th or 7th year. Early tooth of teeth due to caries may happen at the age of six months. This may happen more in bottle-fed babies. And early tooth loss can be prevented by maintaining some simple hygiene measures or tricks. You can take a soft clean clothe make it damp and use it to clean baby's gums after each feed. Once when the baby tooth starts coming you can use a soft baby tooth brush to clean them. When your baby becomes two years old or they know that the toothpaste must not be swallowed you can start them to brush with tooth brush with toothpaste on it. A personal experience would not go wrong here. My pediatrician advised me to use toothpaste as soon as your child starts teething. But the toothpaste used for baby must be a specialized one for babies only. There are ample of such baby toothpaste you can choose from. As my pediatrician told me that there is no harm even if the toothpaste is not spitted out by baby if they are using baby toothpaste since it will be of very small amount. Otherwise even if the brush is very soft the very tender gums of kids may be affected and they may grow the habit of brushing without toothpaste. I have followed these and I can boast of very good oral health of both my kids. Moreover, even though your kid is not getting breastfeed and you are giving bottled milk do not give them sugary liquid in the bottle. Stick to formula milk or bottled milk only. When your kid reaches the age of one he or she must be able to drink milk or water from the own cup. One point to to keep in mind is never to use bottle feed while in bed. If you do please attend him throughout, clean his gums after feed. Do not let him go sleep with bottle in his mouth. When you see the first occurrence of teeth after the fall you are usually very happy. That there is nothing to worry. Permanent or adult teeth have started showing up without much delay. But within a month you are quite astonished to watch the size of her teeth. It is so large that probably you wish to compare it with your own front teeth. And may be find it bigger! But trust me. There is nothing to worry at all. I made a big issue with this and ran towards my dentist. And he said that just relax. If the new adult teeth have to occupy their own space before other teeth come out. And the teeth will not be ever growing. They will stop growing. But her face and mouth have to grow and take shape. When she will have an adult face and mouth her new teeth will look proportionate to her size. Sometimes kids in the age group of one to five loss their teeth due to some accident. They find their adult teeth coming only when the actual age of adult teething comes. Like if you have lost your baby teeth at one or two years of age the adult teeth will come only after the age of six or seven when it is time of normal adult teething. In some cases adult teeth may take as long as 10 years and even erupt at the age of 11. Again sometimes in normal cases of baby teeth falling too, the arrival of new adult teeth can take as long as one year. Dentists have confirmed this fact too. This is only delayed eruption in medical terms. Sometimes the tooth also needs more time due to hardened gum. This is very rare but consulting a dentist is a must and he may need to make a small incision to make way for the adult tooth to come. This happens children elder than 7 years of age. Sometimes as a result of any fall or hurt the teeth of kids get darkened. What should be done in such cases? If the tooth gets darkened as a result of hurt or fall new teeth may erupt early in a few days bypassing the existing baby tooth. In that case the darkened teeth should be extracted immediately by a dentist. If new teeth are not erupting one should consult a dentist and if required an X-ray of the hurt tooth may taken to check whether the root of the tooth is affected as a result of the fall. Watching your kids growing is amazing! In a away you can relive your own childhood through your kids. Teething period is clumsy for the kid. 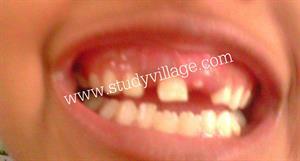 He/she finds it difficult to chew their food during the period of tooth loss. It starts loosening, then falls, sometimes it happens while in sleep too. Little bit of blood, little pain is absolutely normal. With you around and some regular care can ensure healthy growth of teeth for your child. This is a good resource that every parents should see and a very good work by the author. To solve teeth problem in children, they should be taught the importance of having problem- free teeth and also how to take good care of their teeth. It is the duty of the both parents and the teachers to educate the students about the dangers of not taking care of the teeth. Likewise, domestic education should be introduced in the school curriculum so that the students will actually know how to take care of their teeth.